The La Lucha The Struggle poster is a limited edition of 50 archival inkjet prints. Price: $75.00 plus $10 shipping and handling. 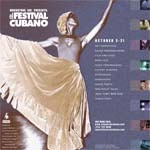 The La Lucha The Struggle and El Festival Cubano posters created by Luis El Estudiante who oversaw their silk screen printing by Goire in Santiago de Cuba. Each of these posters is limited to an edition of fifty. Price: $100 per poster plus $10 shipping and handling. 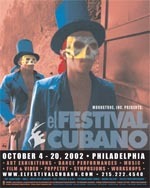 Two offset posters from El Festival Cubano 2001 and 2002 based on photographs by Laurence Salzmann are available. The 2002 poster was designed by Han Salzmann. Price $20.00 per poster plus $10 shipping and handling.